In March 2015, after the completion of an impressive $10 million renovation that followed the devastation wrought by Hurricane Odile, Marquis Los Cabos opened the doors to its stunning property overlooking the Sea of Cortez. 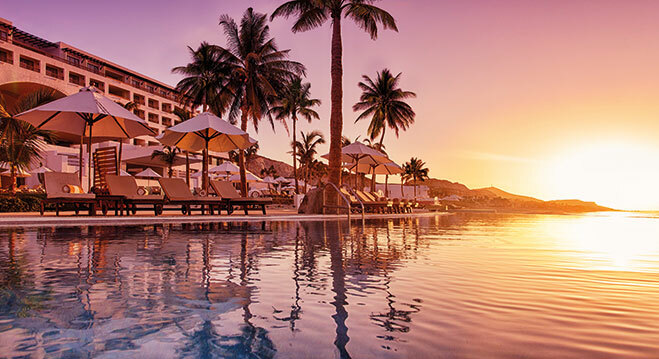 Nestled on the southern tip of the Baja Peninsula, the all-suite, all-inclusive, adults-only resort is paradise. Guests are greeted by a giant arched structure that houses the open-air check-in desk against a backdrop of the Pacific Ocean. The gorgeous setting combined with luxury accommodations is a recipe for pure relaxation. Each suite offers ocean views, while casitas include a private plunge pool on the patio. Six world-class restaurants and bars ensure something for every taste bud, though the best amenity is the wake-up call accompanied by a fresh pot of coffee and basket of sweet rolls. The resort’s three infinity pools overlooking the turquoise sea beg for hours spent soaking up the sun while daily entertainment that includes wine and tequila tastings, live music, dance lessons and evening movies outdoors are sure to lure you off the chaise lounge. A must for every couple is the serene holistic Spa Marquis, 13,000-square-foot space offering an array of incredible spa treatments crafted with indigenous natural ingredients including clay, salts, seaweeds, and essential oils. The attentive staff, pristine white beaches, and ocean views (complete with dolphins and rays) ensure a memorable stay. More couples are choosing to postpone their honeymoon for up to a year after their nuptials.